Create a promotional mailer that will be sent to existing Garden Club of America (GCA) members and encourage them to take the time to cultivate their own gardens. The mailer should meet US Postal regulations for bulk mailings to save on postage costs. 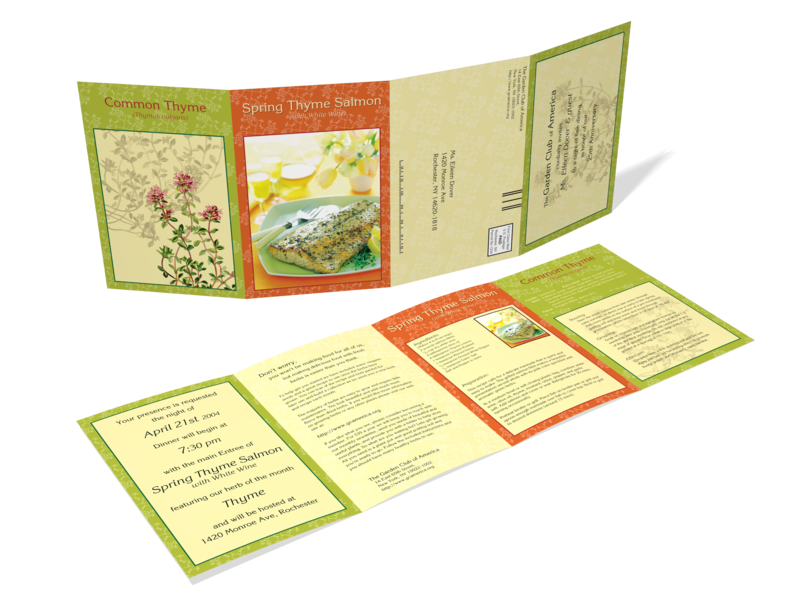 Everyone with a mailing address is quickly inundated with bulk "junk" mail. 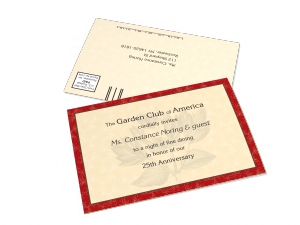 The vast majority of this mail is filtered out with a cursory glance and disposed off without ever being read. 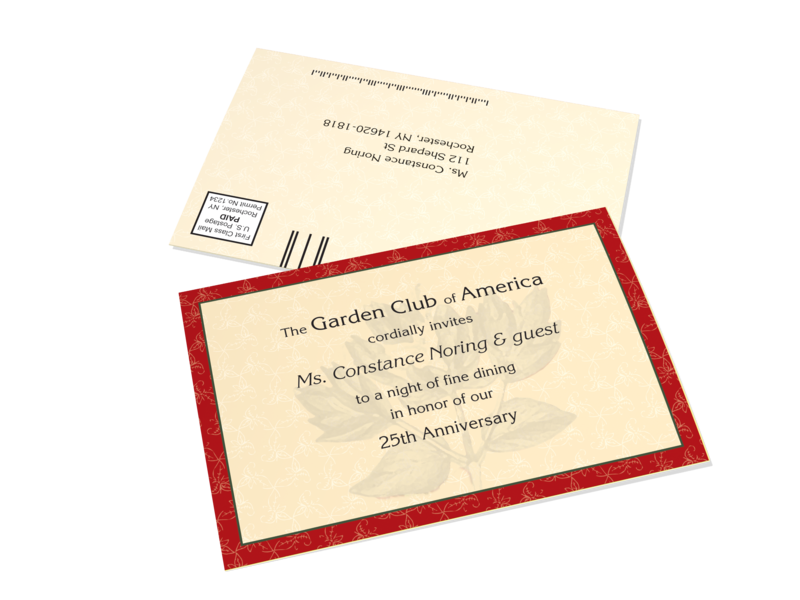 To improve the odds that the GCA member reads the mailer it will utilize variable data printing to disguise itself as a personalized invitation to a dinner party. 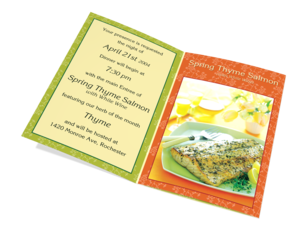 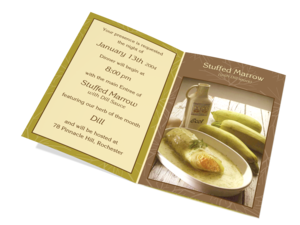 Each mailing will entice the reader with a picture of the main dish and reveals the location of the party to be at the reader residential address. Further marketing text explains the disguise and encourages the reader to utilize an attached seed packet to plant their herb garden. 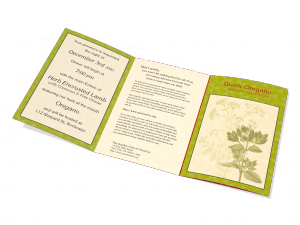 The tear off seed packet includes information about the featured herb with a description of flavor, common uses, planting instructions, plant preferences, and growing tips. 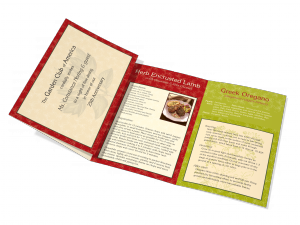 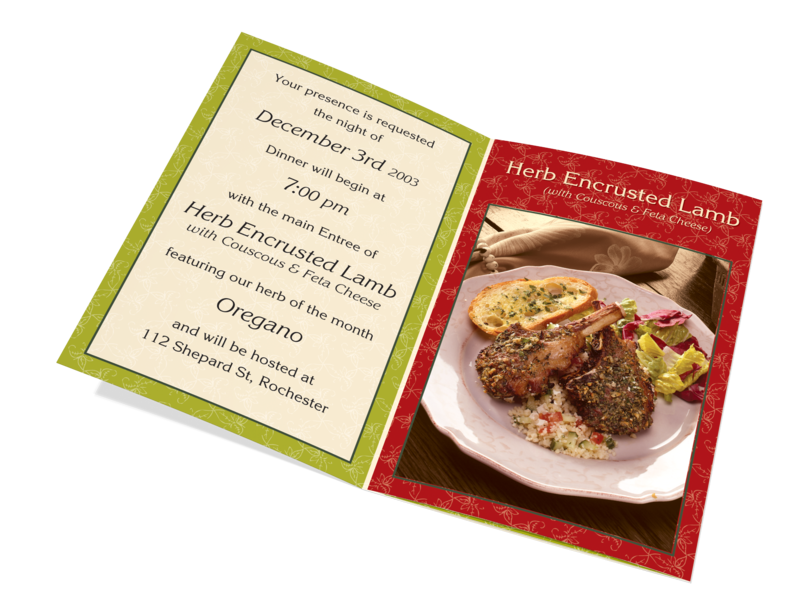 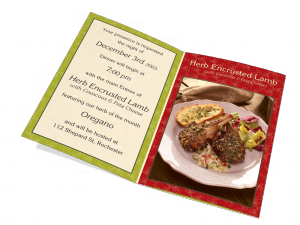 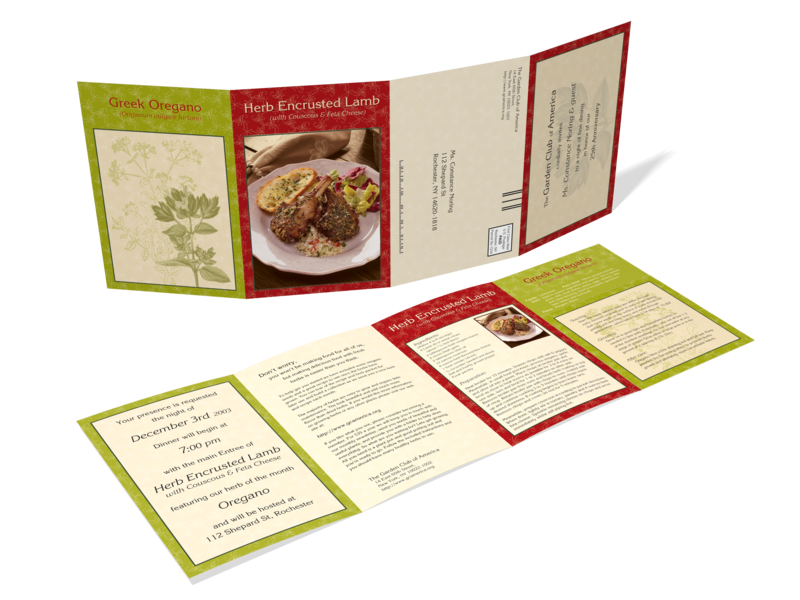 The herb is featured in the creation of the main dish, displayed in the enticement picture, which reveals itself as a tear off recipe card. To offset the added cost of variable data printing the mailer was designed to minimize other factors such as; print layout to minimize paper cost, self mailer format to negate envelope cost, and size format to minimize on bulk mail postage cost. The mailer design took into account how the reader must unfold it to maintain the disguise, transition the thought process to growing a herb garden, in multiple stages. Upon first inspection the mailer appears as a personalized invitation. 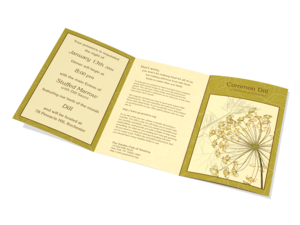 The front of the invitation includes personalized invitation text with an image of the featured herb abstracted in the background. The back of the invitation conforms to postage regulations and contains a variable data address, with Zip+4 bar-coding, and bulk mailing markings. 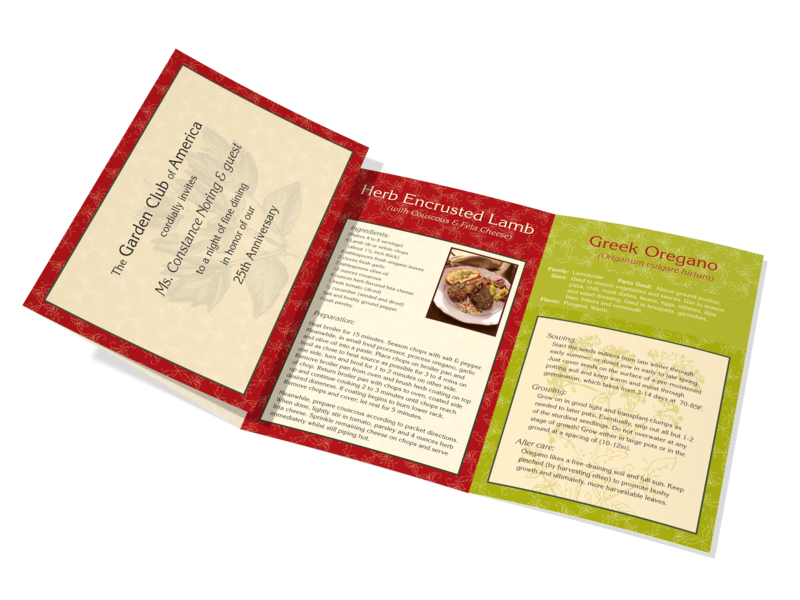 Once opened the right interior page entices the reader with an image of the main dish and the left page reveals the mailer disguise by revealing the location of the dinner party to be the reader's house. Curiosity motivates the reader to unfold again to discover the purpose of this rouse. When unfolded once more the center page indicates the true nature of the invitation. 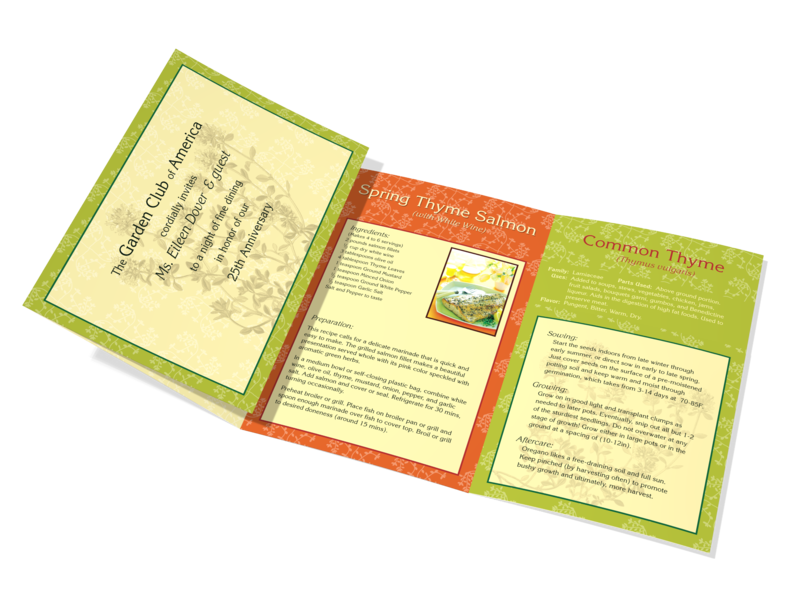 It encourages the reader to cultivate their own herb garden using the attached seed packet now on the right. 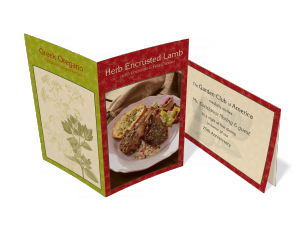 As further motivation the reader is informed that they can use the herb to make the meal with which they were originally enticed with. 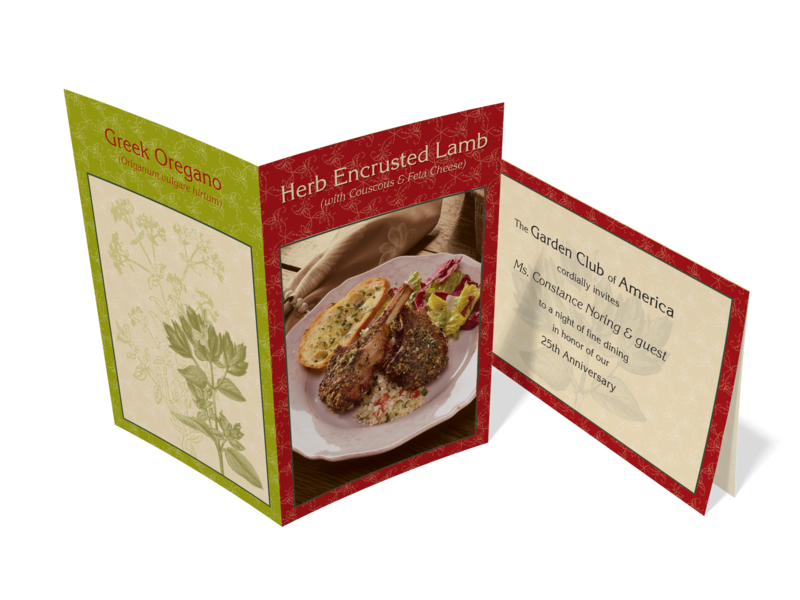 Upon final unfold the mailer expands to reveal a recipe card that utilizes the featured herb in the ingredient list. 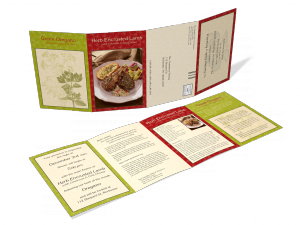 The recipe card and seed packet are designed to be torn off so that a file collection is accumulated over a year long monthly mailing campaign.